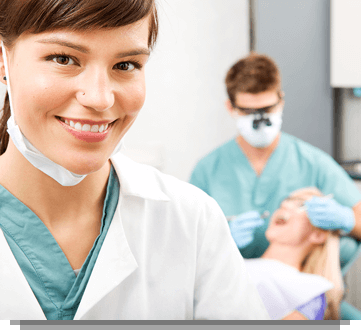 Our world-class implantologists offer a ground-breaking procedure that makes dental restoration possible for almost every patient. 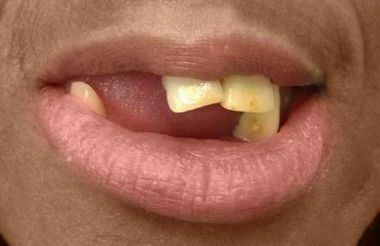 It is even suitable for people who have previously failed implantation procedures due to severely atrophied jaw bones and bone recession. 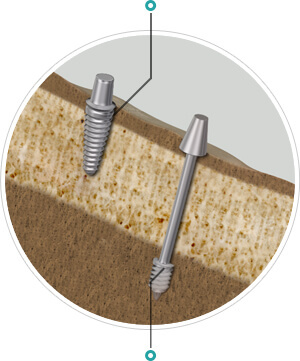 The Swiss 5 day implants are inserted into the layer of hard bone beyond the spongy bone, as illustrated. 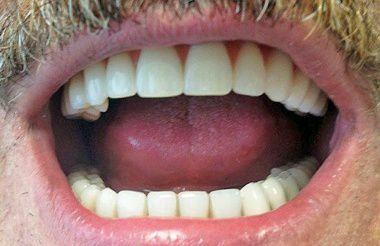 This layer of hard bone provides an immediate, stable foundation for new teeth, while the implants gradually fuse together with the spongy bone. 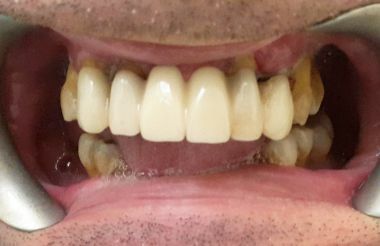 This type of minimally invasive implant surgery (or ‘flapless’ implant surgery, to use the technical term) has been used in dentistry for over 25 years and is a largely pain free method that does not cause any bleeding. 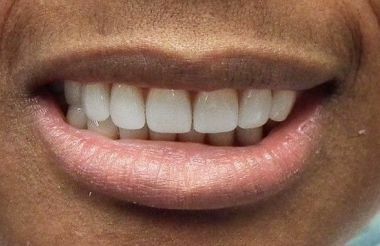 In essence, instead of creating several incisions in the patient’s gums, the surgeon uses a circular punch to create a hole in the patient’s gum tissue into which a titanium bolt (artificial tooth root) is placed and screwed directly into the jawbone, providing a strong and stable support for a bridge for new teeth. The patient has a local anaesthetic or IV (conscious) sedation and in the vast majority of cases no additional pain medication is necessary. 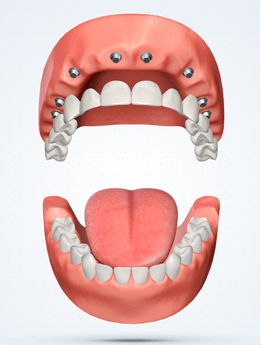 The patients receive their final bridge immediately after the implants have been inserted. Why choose Swiss 5 day implants? 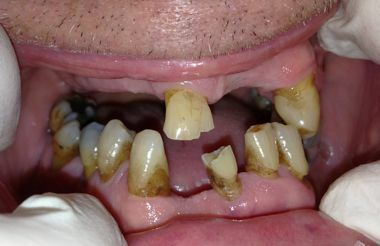 Difficult and "hopeless" cases can be treated (diabetic patients, smokers and patients with severe gum disease). 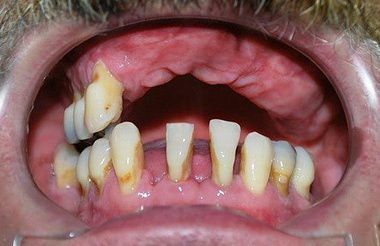 Eligibility Difficult and "hopeless" case can be treated (smokers, patients with severe gum disease or diabetes). Many patients cannot have implants. 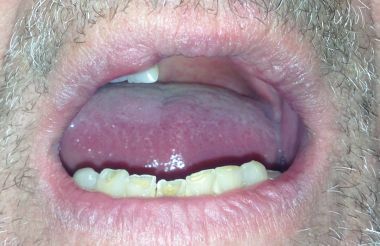 The sinus is located above the pre-molar and molar teeth. 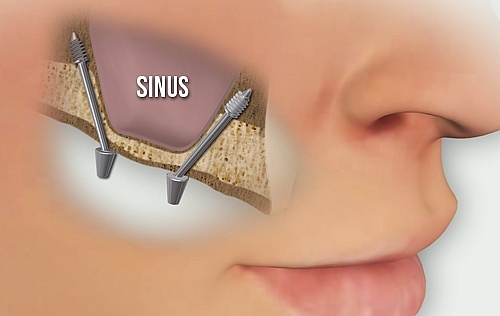 The bone in the area below the sinus is relatively thin in normal circumstances and so people suffering from bone recession in this area are unable to receive implants without a sinus lift and bone graft. 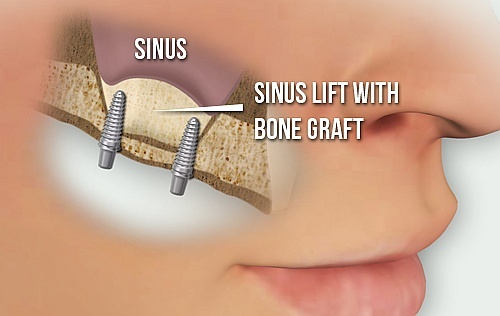 Swiss implants, as can be seen are fitted at an angle of up to 30 degrees, thereby avoiding the sinus area and the need for a sinus lift and bone graft. 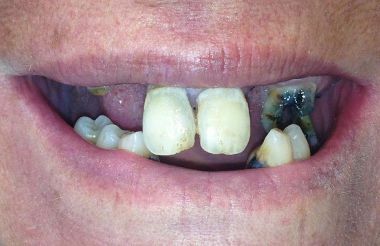 90% of patients who have previously been refused treatment remain eligible for implants. 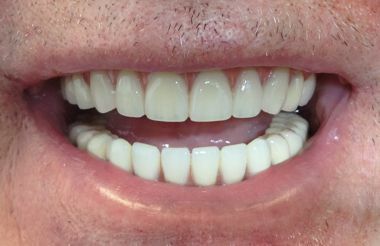 Even if you’ve been refused implant treatment in the past, our implant specialists drawing upon the range of available implant systems will provide you with the solution best suited to you. In cases of bone recession (due to diabetes or the menopause, for example) it is mostly the spongy bone which recedes and as conventional implants are fixed in spongy bone, bone recession renders their installation impossible. 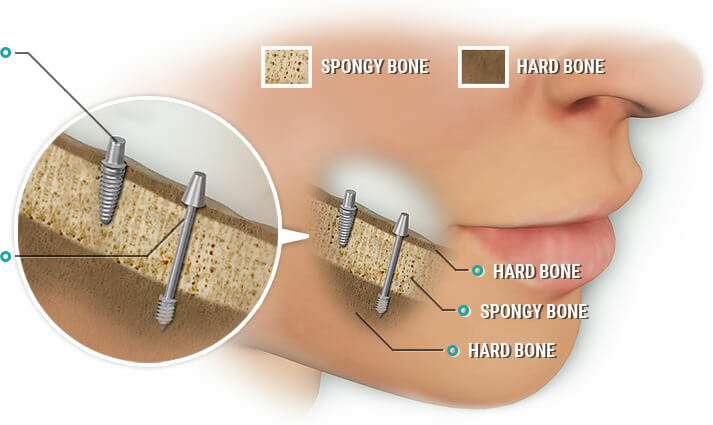 Swiss implants are fixed in the layer of hard bone beyond the spongy bone and as a result are not soley dependent on spongy bone for their stability. 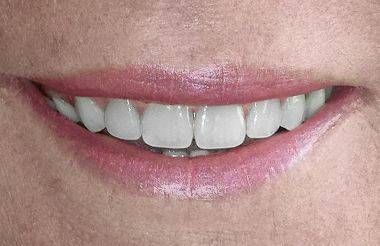 Receive permanent fixed teeth regardless of how long you've been wearing dentures. 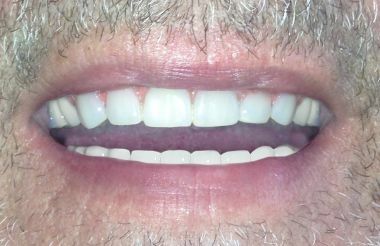 You can still benefit even if you've previously been refused implant treatment. IV sedation eliminates fear and anxiety before and during treatment. These conditions don't necessarily preclude you from receiving treatment. Over the last decades we have helped thousands of patients. 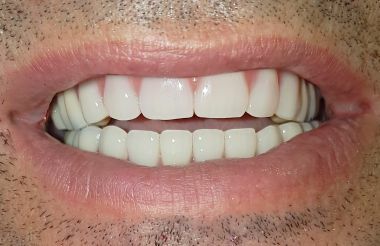 Graduated in 2000 (D.D.S, D.M.D) Specialised in Basal Implantology - immediate loaded implant system; Special interest and advanced training in Nobel Guide Implant Surgery, Ankylos and Straumann. Dr. Szekely was amongst the first dentists to apply the BCS/KOS immediate loading implant system and has been successful in helping patients who have been told they cannot have implants due to insufficient bone structure. 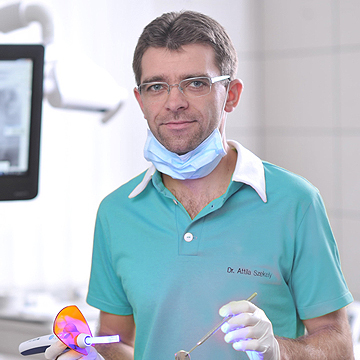 He has built a considerable international reputation for high standards of dental care.